(May 22, 2014) -- The University of Texas at San Antonio Spirit of San Antonio (SOSA) marching band has been selected as the official university band to represent the United States and perform at the 70th anniversary World War II D-Day Memorial Parade and Musical Salute to the Veterans in Normandy, France, June 6. The commemorative event marks the anniversary of D-Day, a day forever known for the Allied invasion of Germany-occupied France and the beginning of the liberation of Europe from Nazi Germany. At the height of World War II, the village of Sainte-Mere-Eglise was recaptured by American airborne and land troops, making it the first Normandy village to be liberated from Nazi tyranny. Seventy D-Day survivors are expected to return to the French town to attend the historic remembrance. 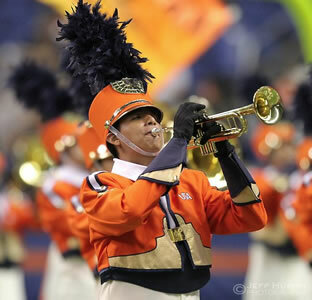 UTSA SOSA Marching Band Director Ron Ellis will lead the San Antonio contingent of 44 band members and 15 parents traveling overseas for the once-in-a-lifetime opportunity. Ellis says the band members raised the trip funding over the last six months, and the parents are covering their own expenses. The trip also has extra significance for Ellis and the band members because several had relatives at Normandy during the war. "This is a huge honor that says a lot about UTSA and the perception of not only what the university is now, but what it is becoming," said Ellis. "It's a tribute to the great leadership of the city, the university and to our top-tier reputation that we were called to participate to represent the U.S.A. at such an historic event." According to Ellis, the marching band will perform before French national leaders, visiting military leaders, high-ranking officials and French President Francois Hollande. President Barack Obama also is expected to attend. The SOSA ceremonial group begins rehearsals next week on musical selections for the ceremonies and parades including the U.S. and French National anthems, "The Longest Day March," "Amazing Grace" and music for several feature performances that will include "Texas, Our Texas," "Appalachian Spring" and "Strike Up the Band," among others. The UTSA marching band also has been asked to be prepared to perform "Hail to the Chief." In addition to the musical performances, SOSA marching band members will have the opportunity to visit several other landmarks over the week in France including Omaha Beach, the Eiffel Tower and the Louvre Museum.